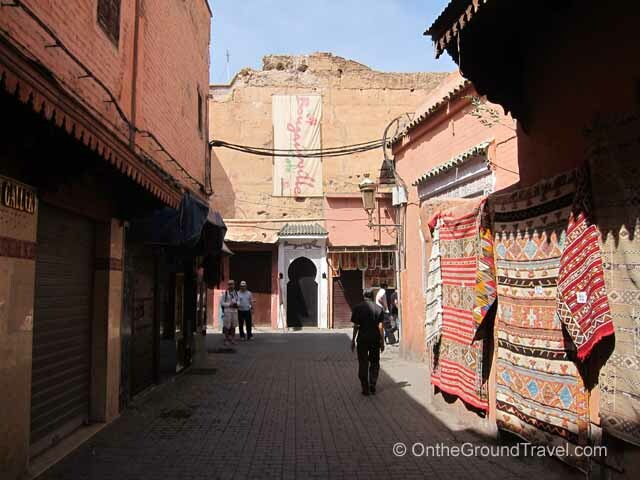 After Marrakech (see tips and adventure log here), we drove over the Atlas mountains and through the Dades Valley and Gorge before reaching Mazouga, the last town at the edge of the Sahara dunes of Erg Chebbi. From Mazouga, we then trekked for an hour and a half on camel to reach the Berber camp deep in the desert. Due to the extremely harsh climate, most of the original inhabitants of the Sahara, the Berber people, have long moved out. Today, few Berber camps remain and their main source of income are either the tourists who are crazy enough to spend a few days in the desert or the dare-devils who go to surf the sand dunes on boards, ATV’s, or 4×4’s. 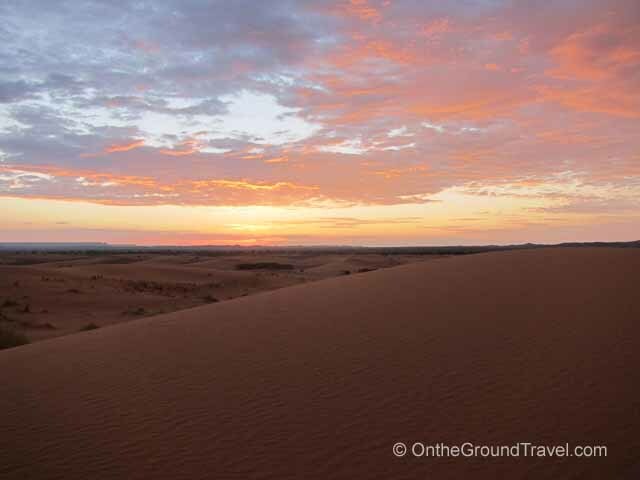 There are no words to describe the beauty of the Erg Chebbi dunes. The golden sea of sand dunes has no beginning or end. 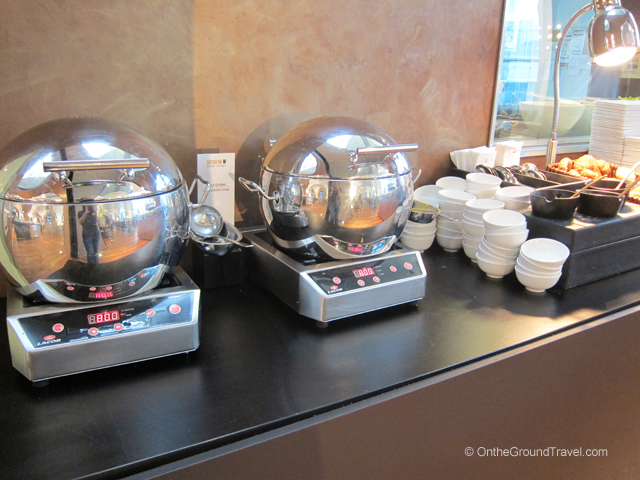 One after another, they line up before your eyes in seductive curves. Their sands shifting ever so gently under the bright blue sky with few clouds. 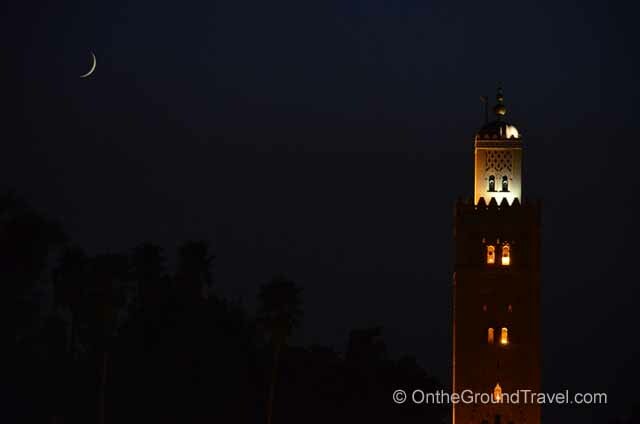 At night, although the desert was pitch dark, we ventured out with our Berber guides, who navigated by stars, to another sand dune, and we laughed, joked and slept on the Sahara sands. It’s so quiet and peaceful out there. It was a huge contrast from Times Square in New York City with all it’s yellow cabs, big crowds, tall buildings with neon lights and electronic billboards that flash today’s stock price and latest world news before your eyes. In New York, you can’t get away from the world, the world comes to you. 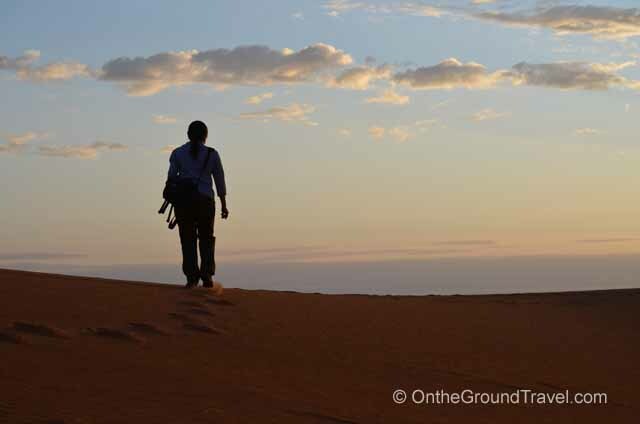 In Sahara, well, it’s just you and nature, coexisting at the same time and in the same space. Before we arrived, we had thought the Sahara would be uncomfortable to stay. While it’s true that you give up many modern conveniences by staying in the desert (such as electricity), the Berber have long figured out how to live in the desert comfortably. 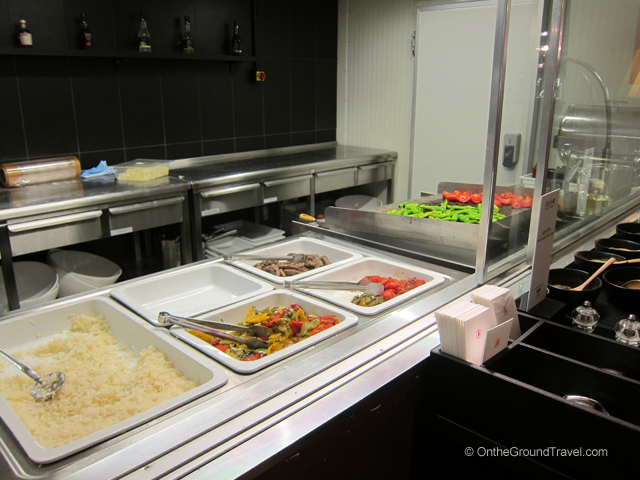 Although our accommodations were simple, the food was fantastic. 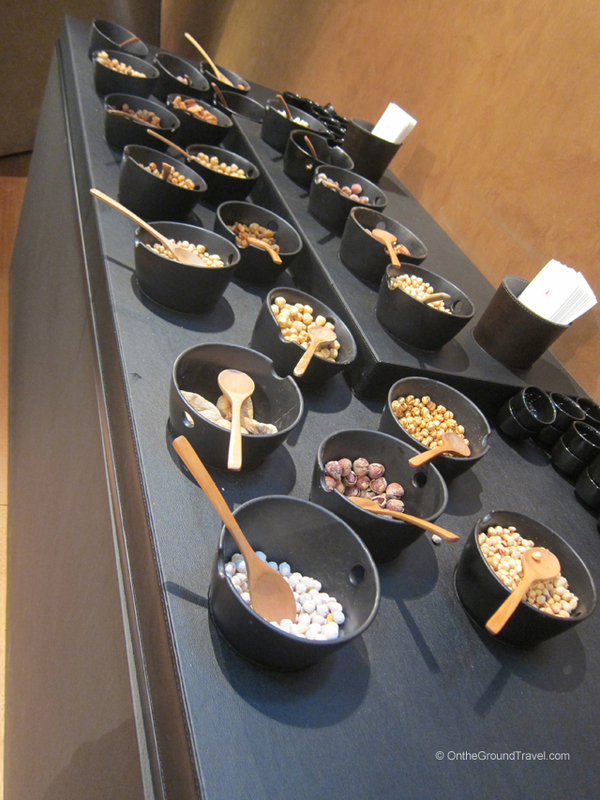 The Berber hospitality was unmatched. 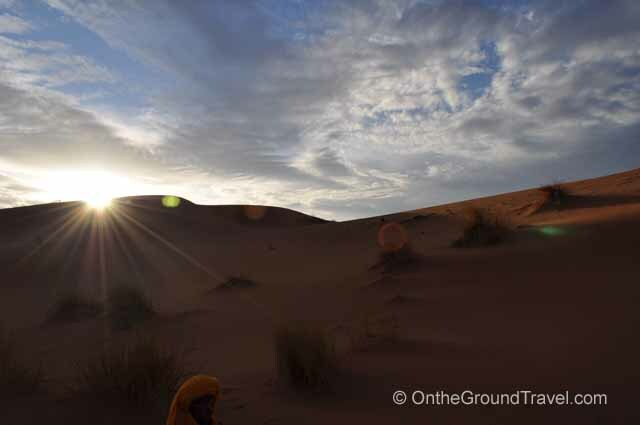 We will miss the Sahara greatly, and it is definitely the highlight of our round-the-world trip. 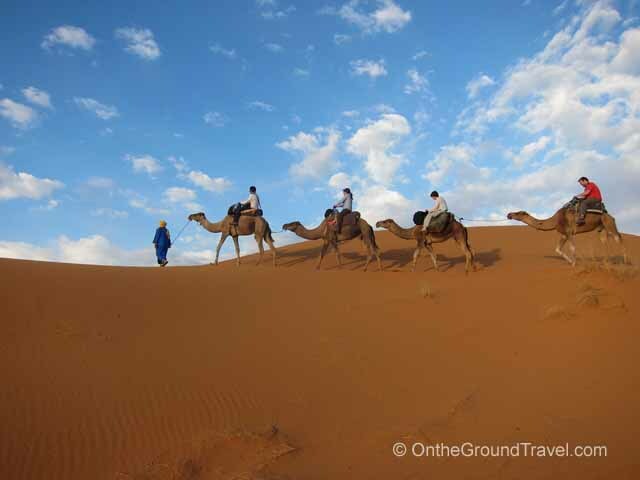 1) Hire an experienced trekking company to take you into the Sahara. 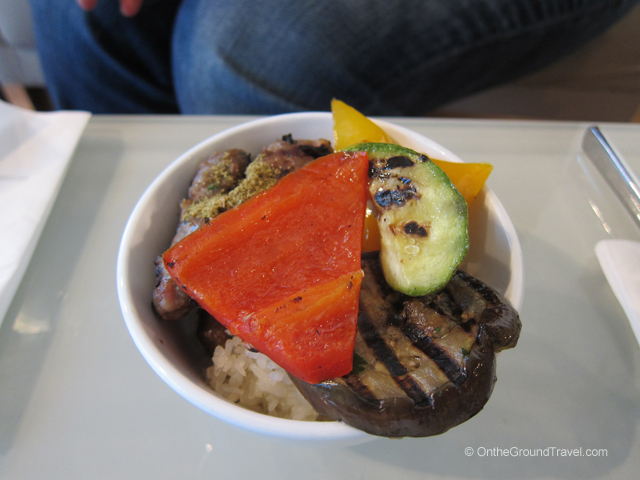 It will greatly enhance your experience. If you need recommendations, drop us a note. 3) Only stay out in the sun early in the morning or late in the evening. The sun and heat are unforgiving. 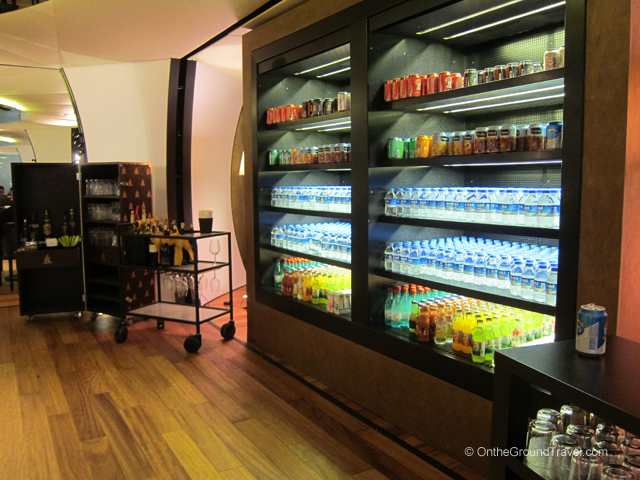 4) Be prepared to bring a new set of clothes after the desert tour. Everything you have on will have sand on it. 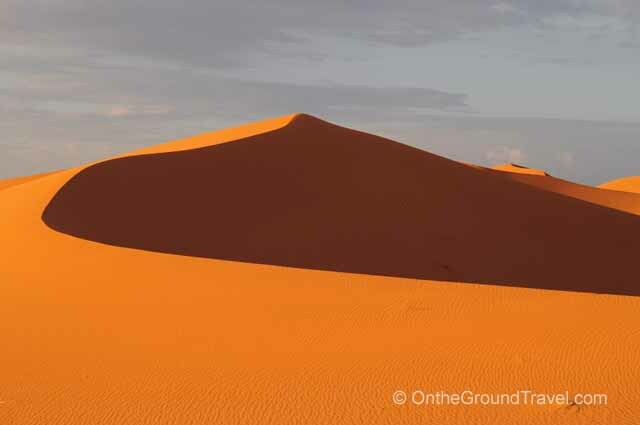 Want to know everything you need to pack for a desert tour to the Sahara? 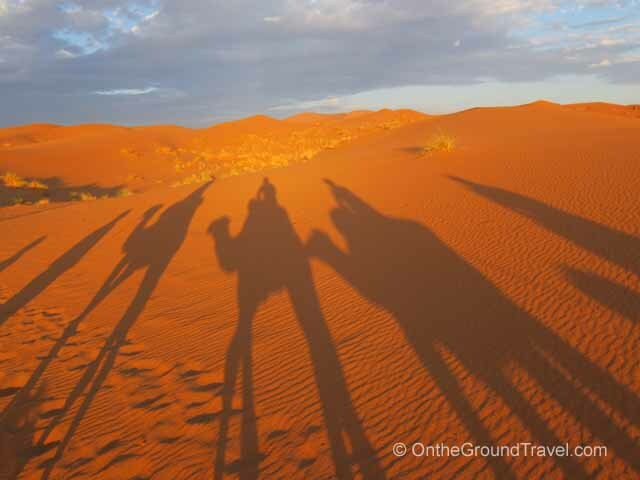 We compiled a Sahara Desert Packing List for you! 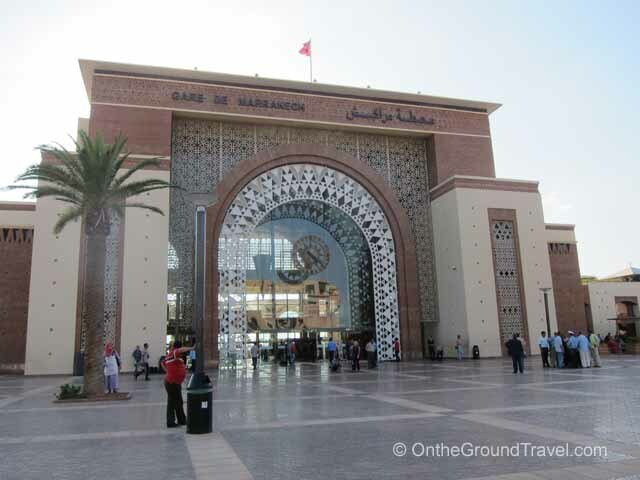 Another article you may be interested in is our interview with a local guiding company on planning a Morocco Sahara desert tour. Hope you enjoy it. 1) Relax. 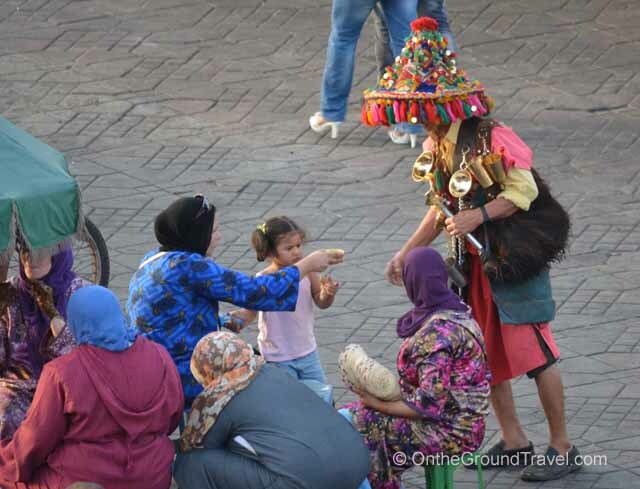 If it’s your first time to Marrakech, you will immediately notice that this town has some of the most aggressive touts in the world. They will hold on to your arms/shoulders/other body parts to stop you in your tracks, follow you for blocks, and never take ‘No’ for an answer. Our recommendation is take all this with a sense of humor. If you are too uptight, you will never enjoy the experience. It can be difficult to ignore them, but just remember you can’t change their behavior, but you can change your reaction to them, hold your ground and tell them firmly you’re not interested, and then just go about your own business. 2) Be street wise. 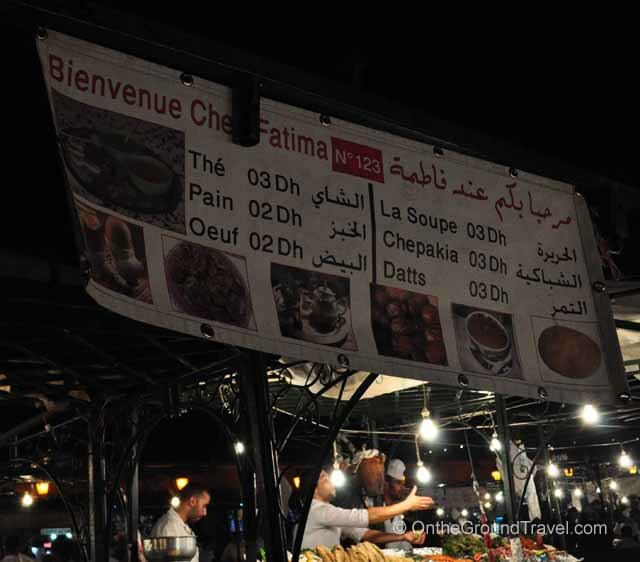 While scams happen everywhere in the world, some of the most common scams in Marrakech involve giving directions. 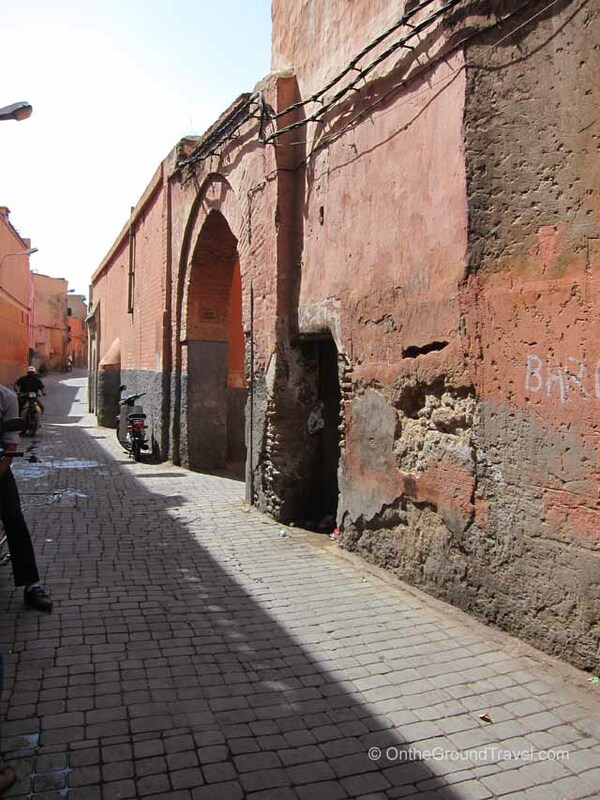 The old part of Marrakech, where most tourists visit, is composed of a number of small alleyways that seem to come together in no obvious pattern or logic. Many alleyways have dead-ends. 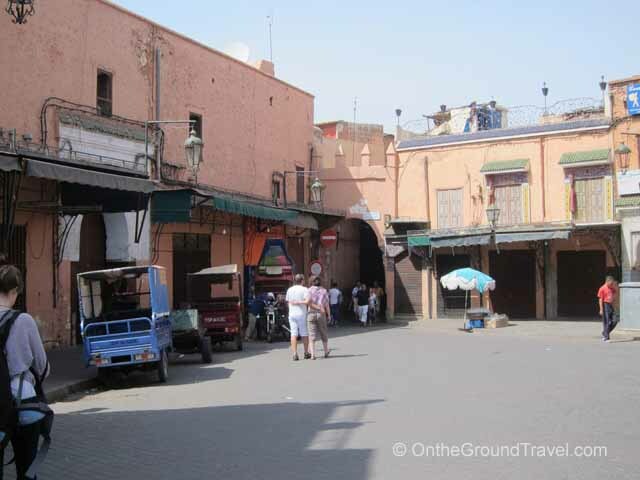 Many shops look the same in the souk with no names or street numbers outside. 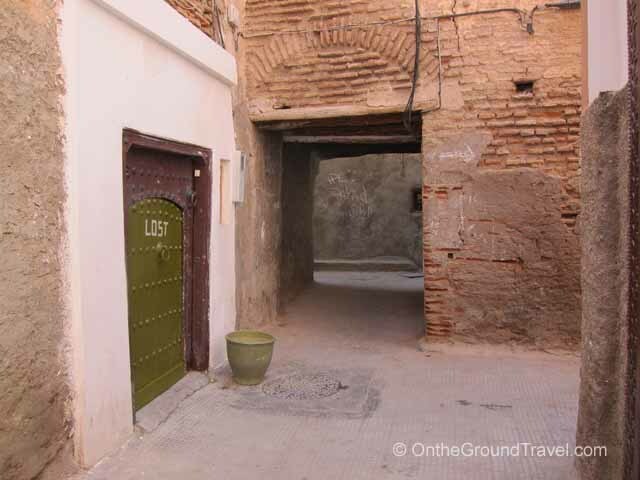 It’s very easy to get lost in the medina. When you get lost (and sometimes, even before you do), someone will almost certainly approach you and try to offer you directions. 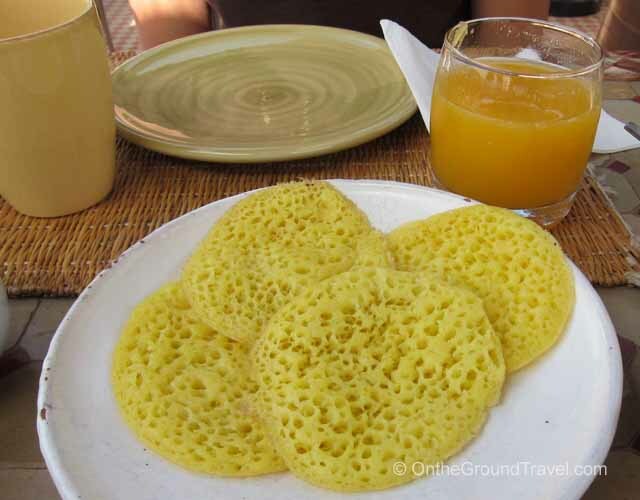 They may say they work for a riad nearby (or even the riad you are staying at…”don’t you remember me from breakfast this morning?”), and they may offer you directions for “free.” Whatever you do, ignore them and do NOT show them the address you are trying to get to. There are too many stories about tourists being purposely led down the wrong path, and before you know it, you are isolated in an unfamiliar territory and even more lost than before. Then, all of a sudden, “free” is no longer free, and to get out of the situation you may have to pay an unreasonable amount (I have heard $50 Euro) just to get rid of the scam artist, and then you still have to find your way back. We heard about this scam before we arrived, and on our first day, someone tried to use this scam on us (unsuccessfully of course!). 3) Don’t assume anything is free. The bread given to you when you sit down to eat? Not free. Someone offers to take your picture? It’ll cost you. A snake charmer holds your hand and insists on taking a picture with you? Take out some coins. Getting directions? Definitely not free. We are not recommending ignoring everyone you meet, but if you are open to these activities, at least agree on a price beforehand. 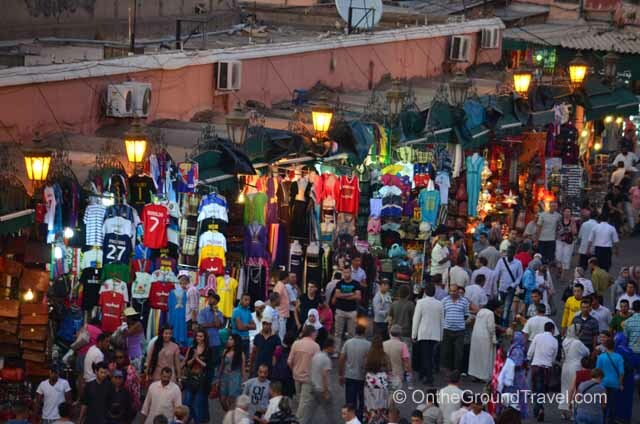 4) Bargain, bargain, bargain in the medina. And then bargain some more. 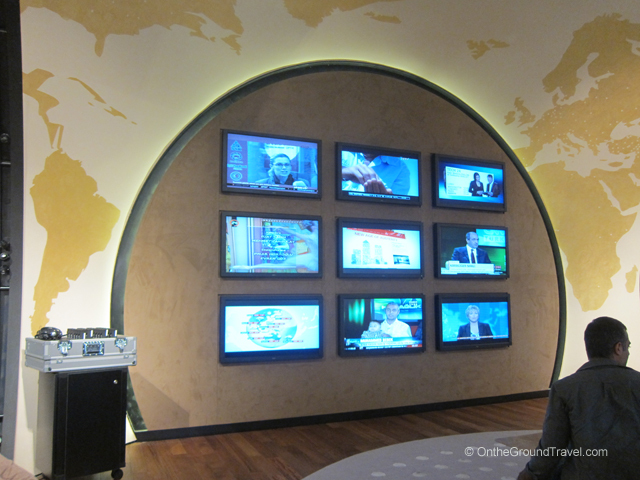 5) Arabic is the first language; French second; Spanish third, and English fourth. 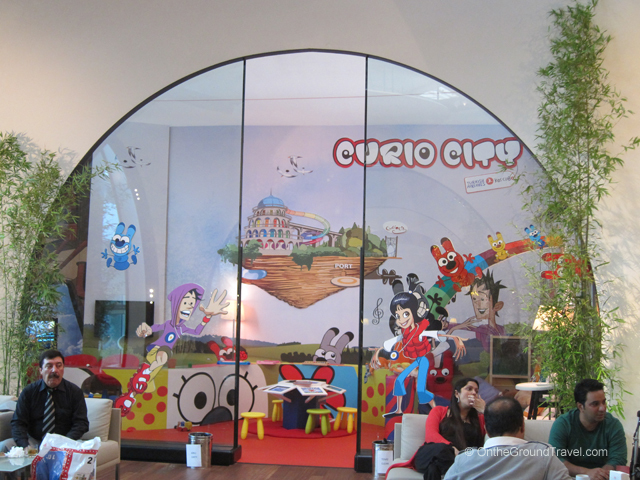 So if you speak Spanish and not Arabic or French, you’re in luck! 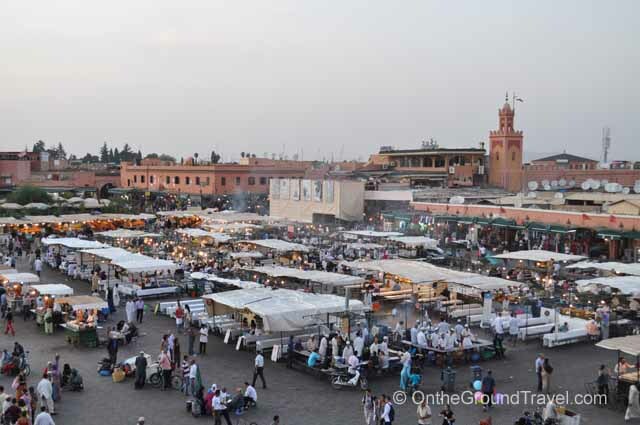 You will find more locals speak Spanish than English in Marrakech. 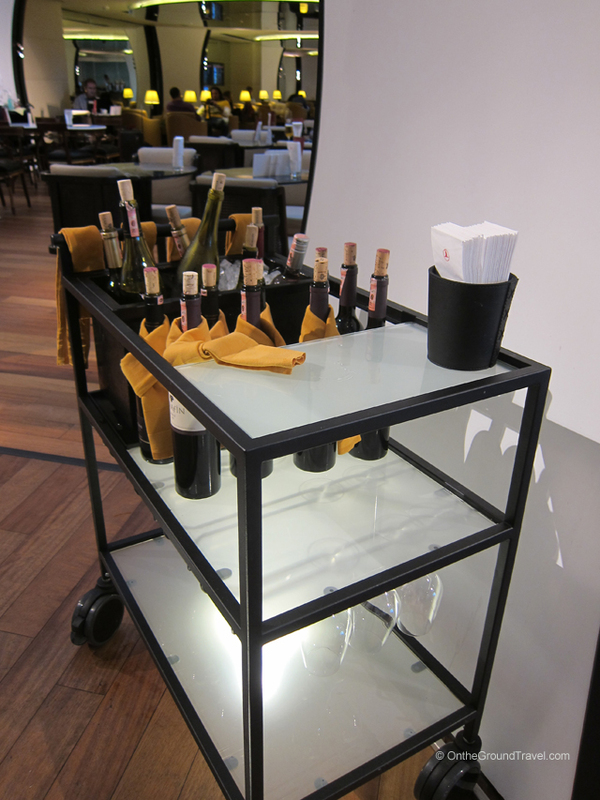 6) Pay attention to the size of the cab you are getting into. 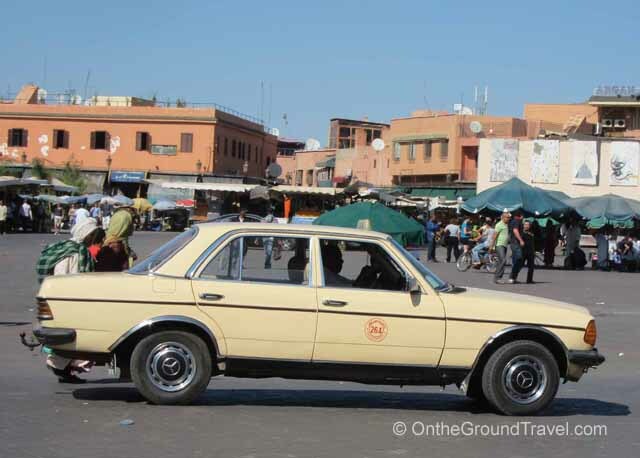 There are two types of cabs in Marrakech: the petit taxi which a small hatchback and the grand taxi which is typically a really old beat up Mercedes. Both are in the same color and unless you pay attention, they may look the same to you. Keep in mind that the petit taxi costs less than the grand taxi. 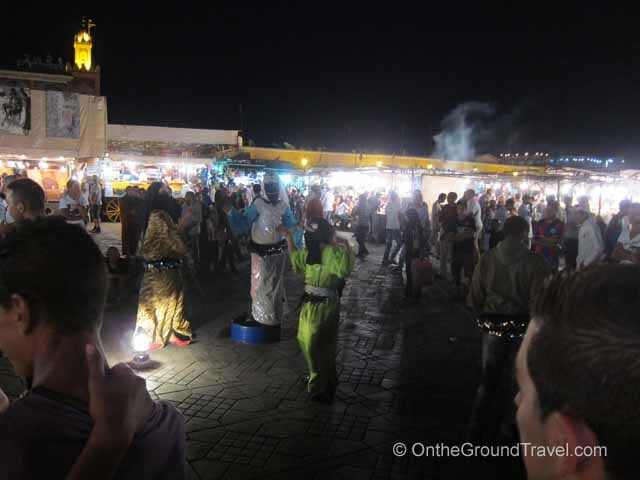 So if you take a grand taxi from the medina to the hotel one night, expect to pay more than if you hail a petit taxi back from the hotel to the medina the next morning. 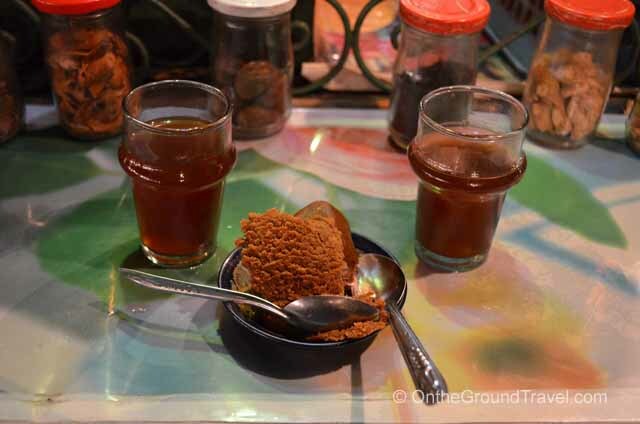 7) Agree on a price before getting into the taxi, and don’t be afraid to haggle down the first price offered by the cab driver. None of the cabs we rode used (or even had) a meter. 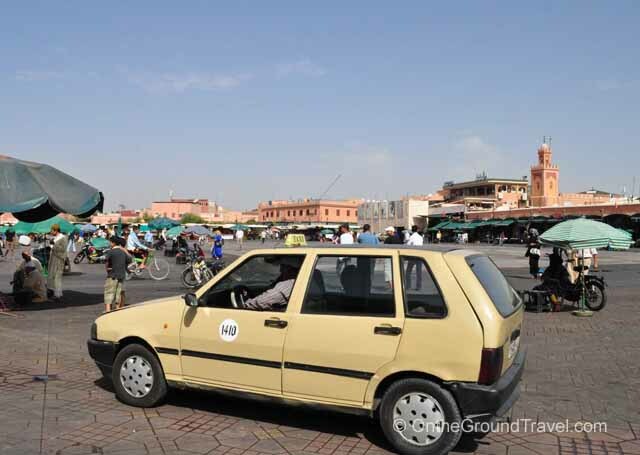 The official cabs from the Marrakech train station is at least 3x more expansive than the street cabs. Walk a block away from the train station to hail a cab instead. 8) If you speak English to bargain the price, it’s much better to write down the price you intend to pay in numerics and show it to the local. Again, English is the 4th language in Marrakech. Fifteen to you will conveniently sound like fifty to them. 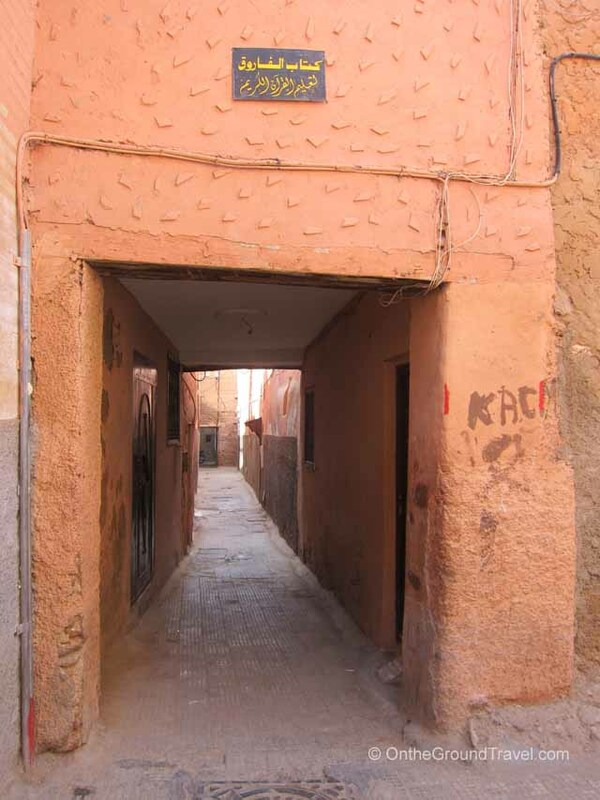 9) Google Maps does not give you accurate directions in the medina mostly because not all the alleys have been fully incorporated into their maps (yet!). Same is true for Bing, Yahoo!, and MapQuest map services. 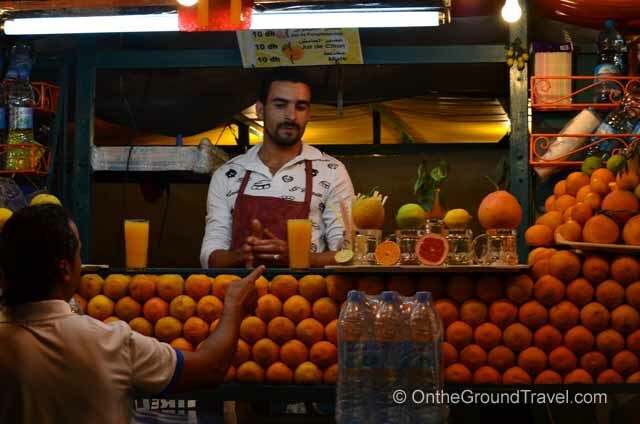 10) Absolutely try the orange juice from any of the vendors in medina. It’s the best tasting orange juice we have ever had no matter which stall we tried. 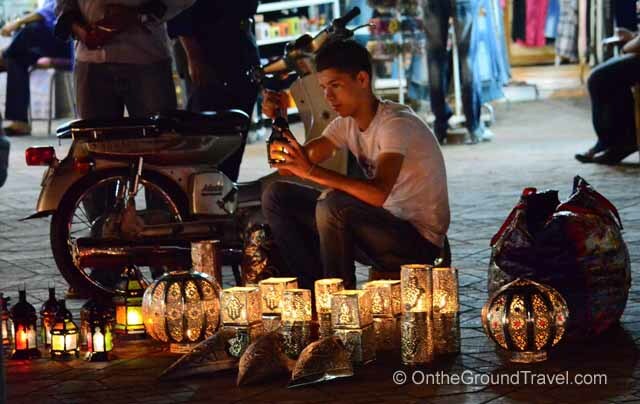 After Peru (adventure log and tips here), we ventured into Marrakech in Morocco. 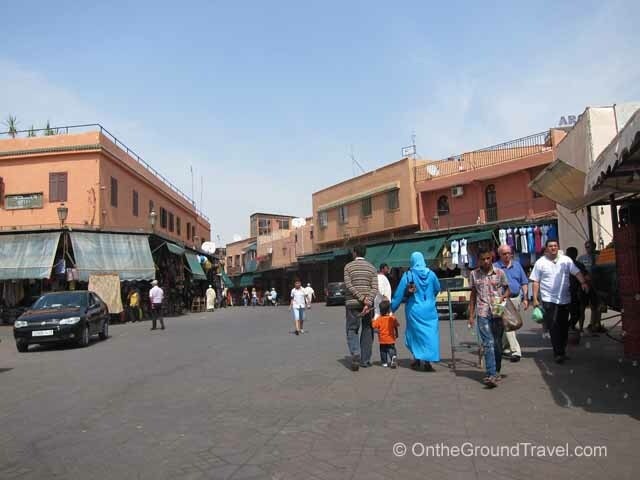 The highlight of our trip to Marrakech is no doubt Djemaa el Fna, the main square in the old town of Marrakech. 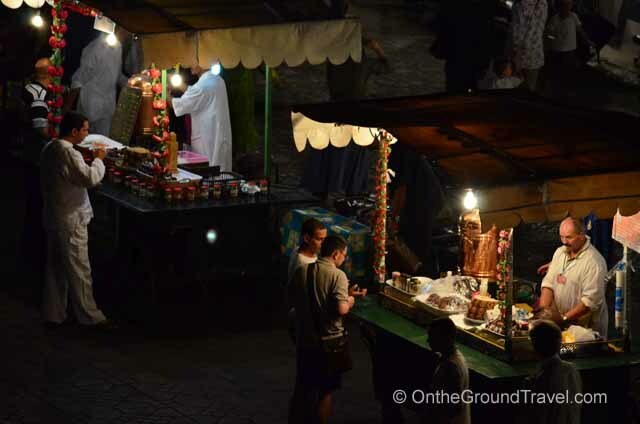 From snake charmers, monkey handlers, African drummers to food vendors that sell snails, spiced tea, lentil soups and kabobs, the square has something unique to offer everyone day and night. 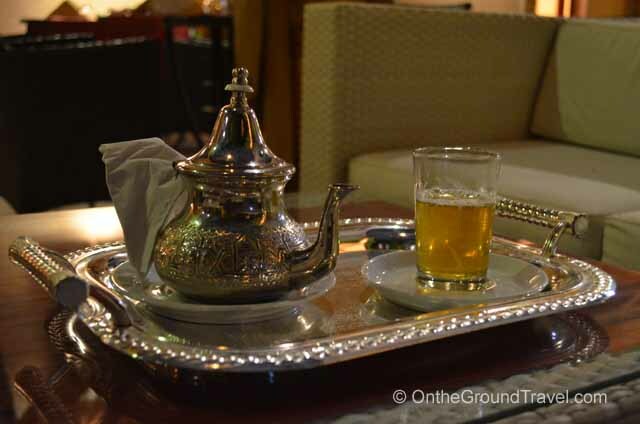 We stayed at Riad Andalla which is within walking distance of the square. 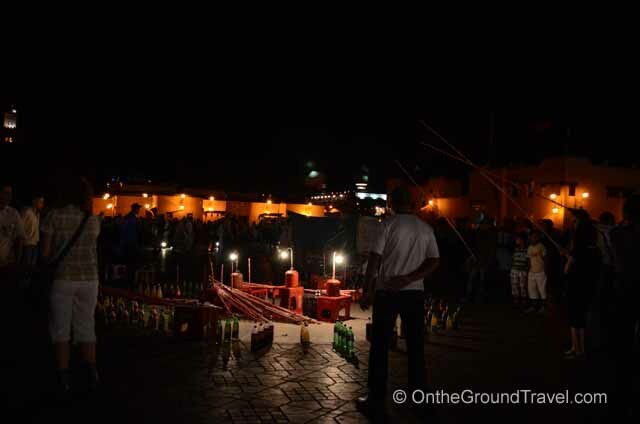 This offered us many opportunities to walk past the medina at different times of the day. 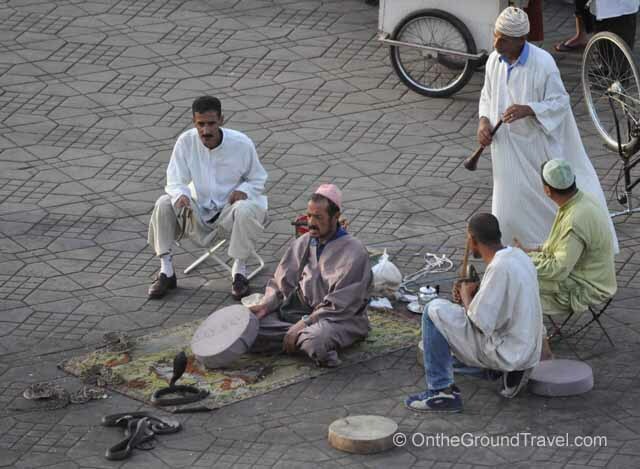 The medina wakes up when the African drums start beating around 8am. 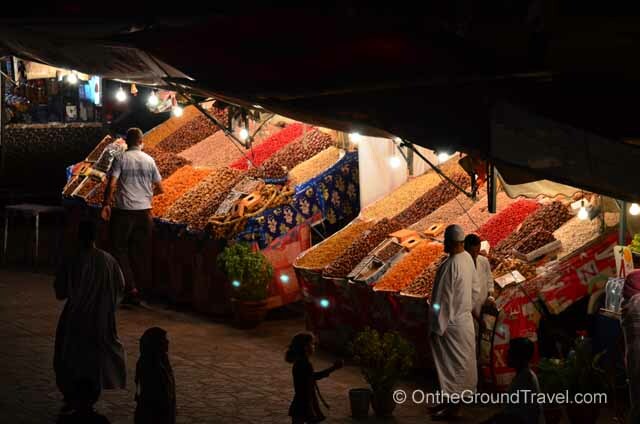 During the day, most activities occur in the souk (traditional market) where one can spend hours meandering the narrow alleyways of Marrakech looking for authentic Moroccan souvenirs. 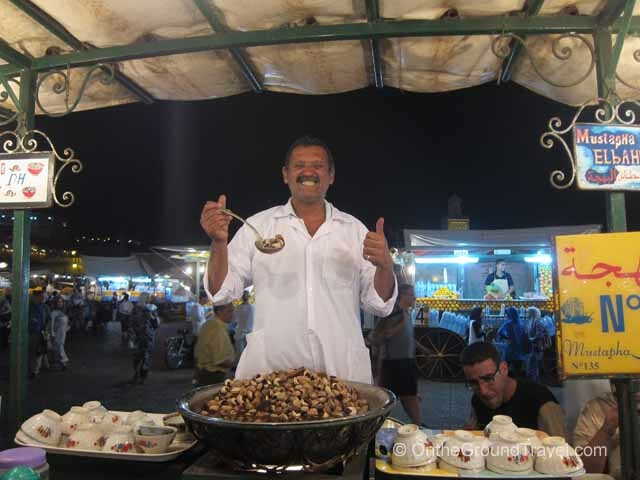 In the main square, vendors selling orange juice and dried dates will wet your appetite as well. 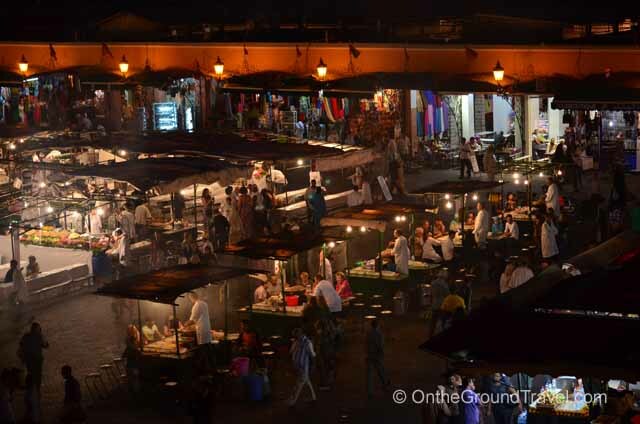 Despite all this, above all, the most captivating moment at Djemaa el Fna is in the evening, when the square transforms from an open market with few food vendors to a full blown food extravaganza with a variety of live entertainment. 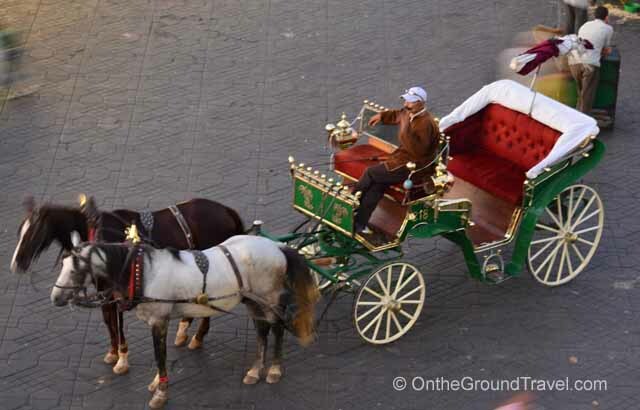 Want to ride a horse carriage? Check. 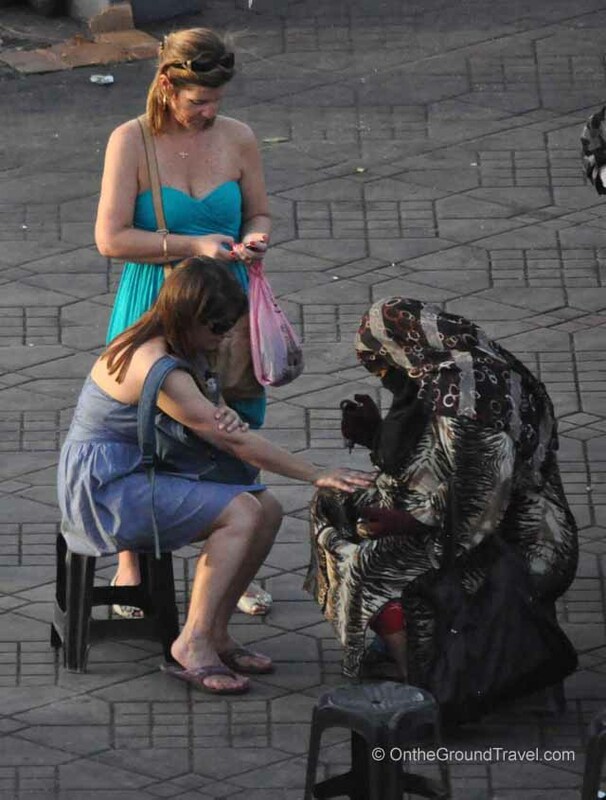 Get a henna? Check. 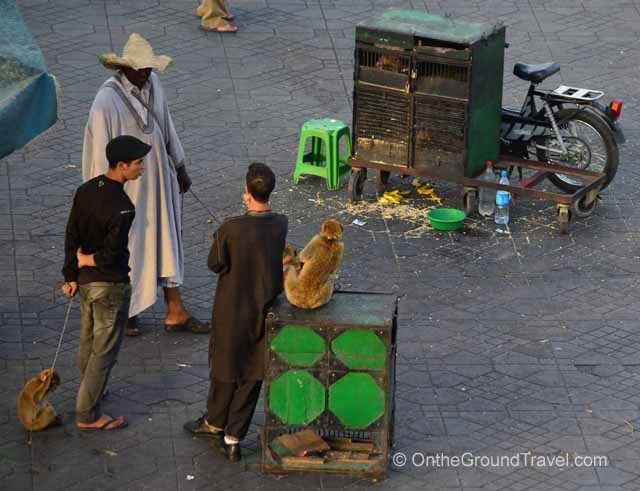 Take a picture with monkeys on your back in front of the snake charmers? Check. Belly dancing show? No problem. 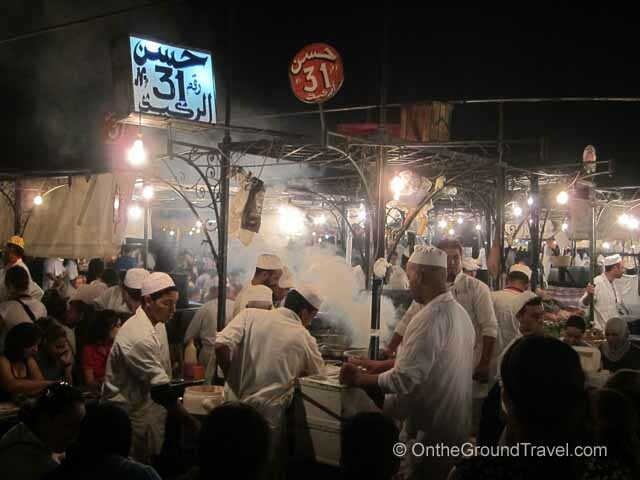 How about having a five-course dinner at different food stalls all in the medina for less than $6 USD each? Of course! 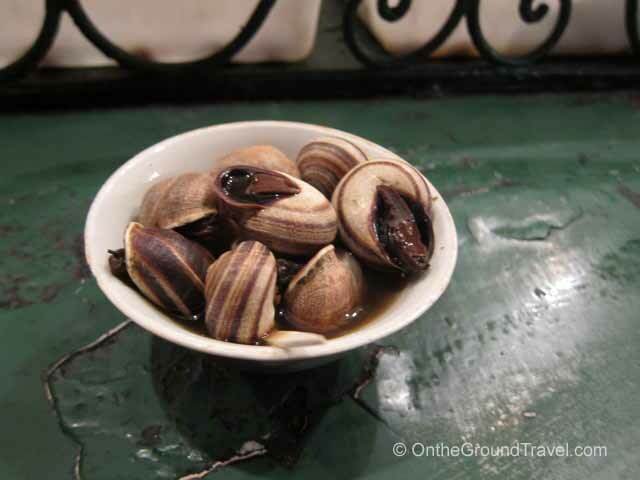 May I offer you a street game with fellow tourists after dinner? 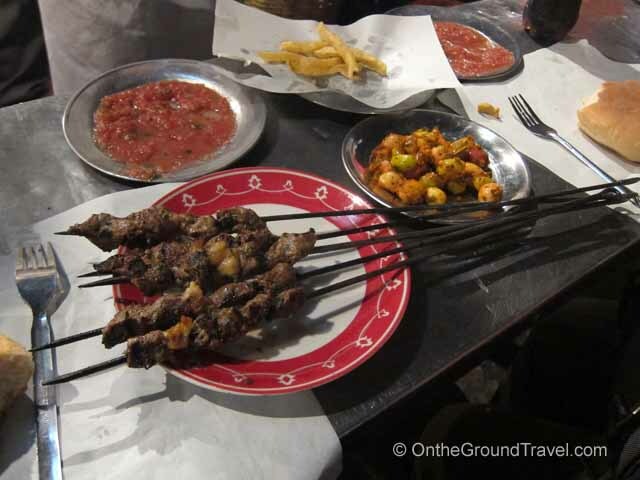 Whatever fancies you, Djemaa el Fna has it or something similar on the table. 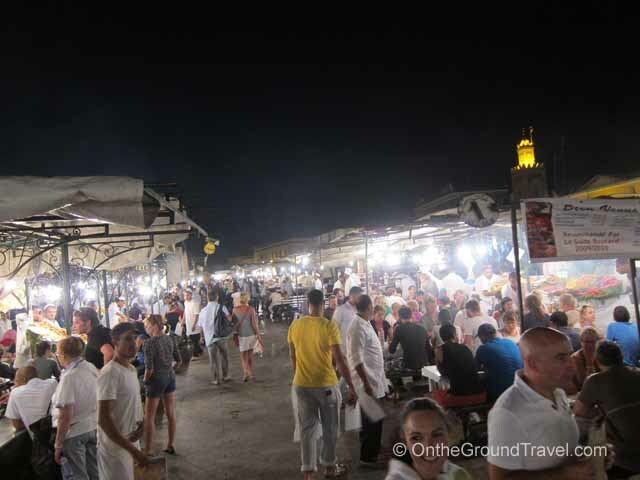 We, in fact, were so mesmerized by the atmosphere in the medina that we went back almost every night for dinner or to people watch. 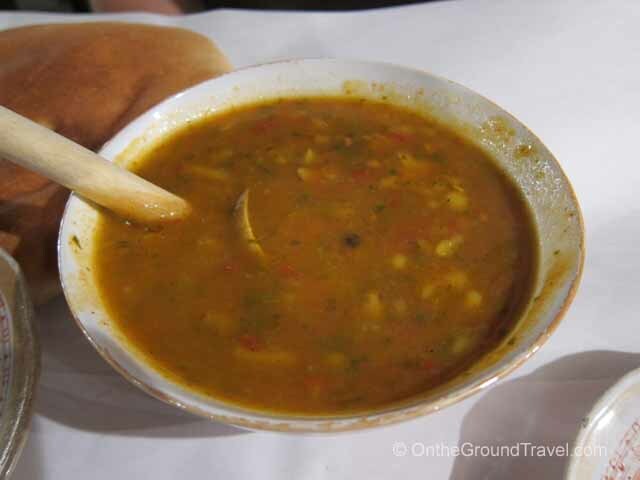 If you haven’t been to Djemaa el Fna, we highly recommend it. 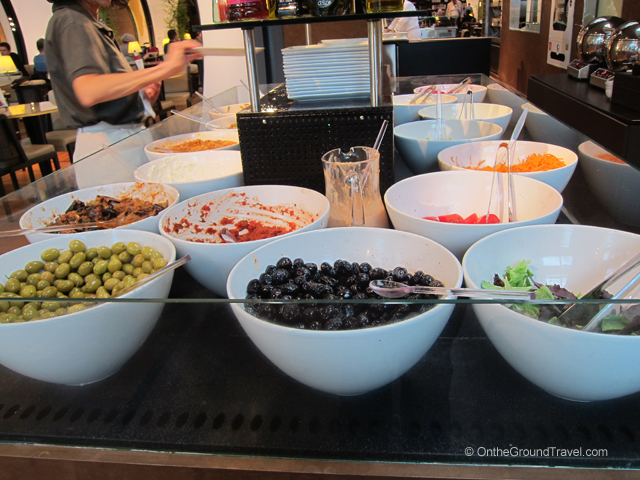 Have you been to another medina that you love? If so, drop us a note. We would love to hear about it! 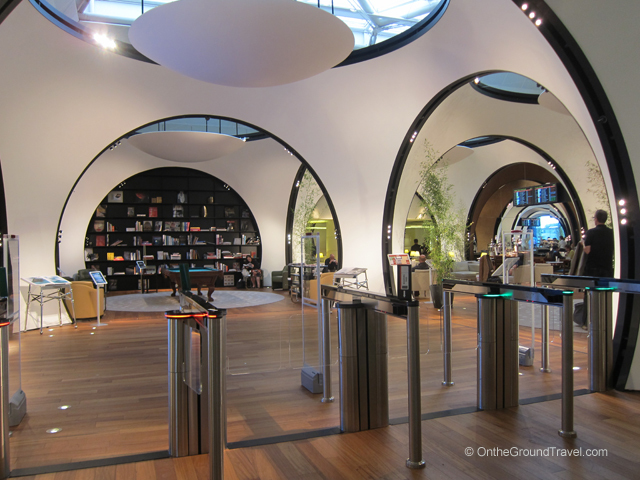 Ok, as seasoned travelers for business and pleasure, we have been to many different airport lounges before – domestic and international, across many different airlines. 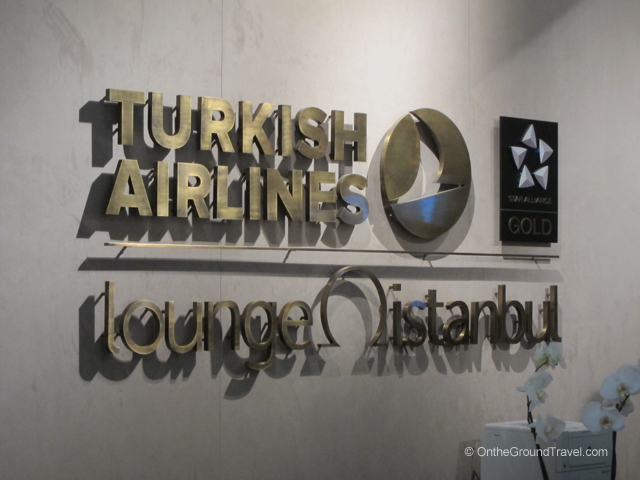 Usually, once you have seen one lounge, every other lounge is pretty much the same. It’s quite difficult to impress us anymore. But WOW! 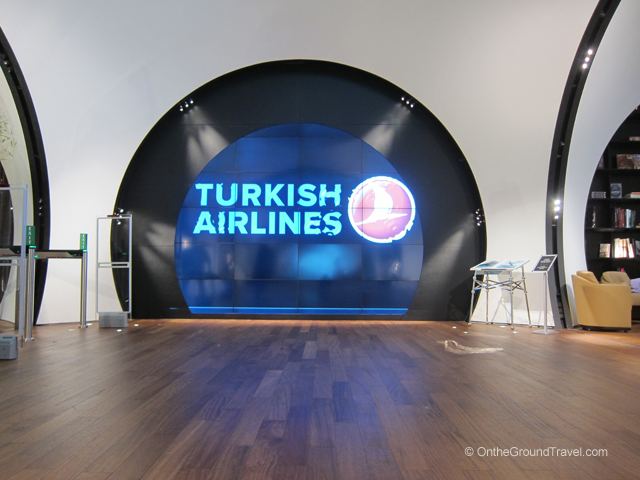 The Turkish Airline lounge in the International Departure area in Istanbul’s Ataturk Airport (IST) really surprised us. I mean really surprised us. 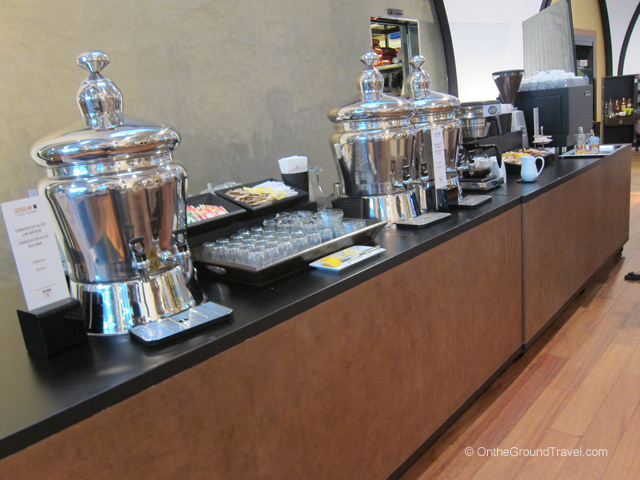 It’s by far one of the best airport lounges we have been to, in terms of food and beverage options, facilities, and services. 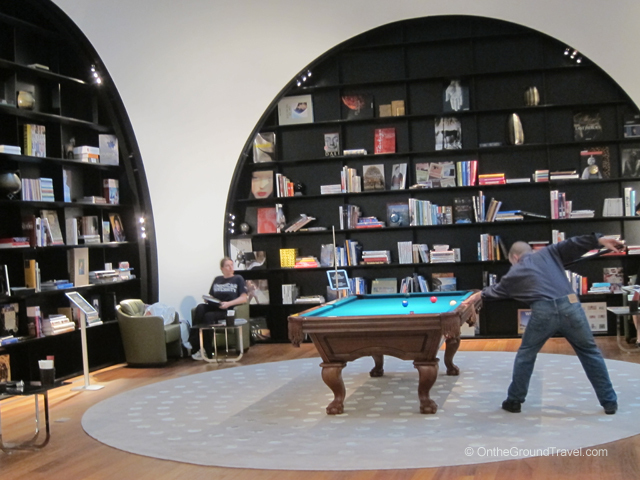 The lounge is spacious with many relaxation areas including entertainment room with big screen TVs (think personal movie room), laptop docking stations, billards room with pool table, a computer center equipped with state of the art Macs and the list goes on. 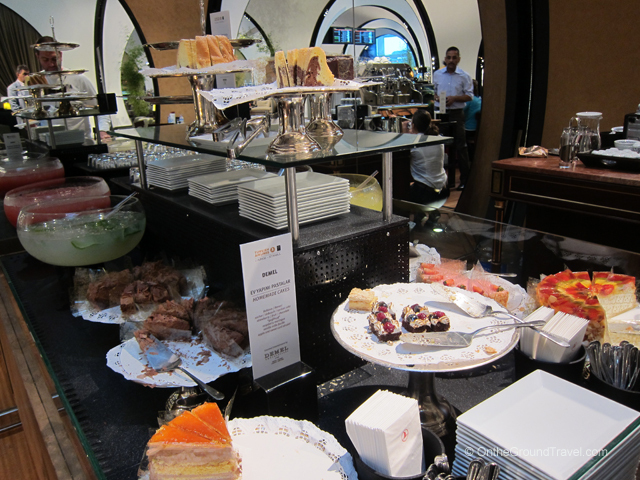 The lounge also offers different hot and cold appetizers, snacks and desserts as well as a wide selection of beverages and liquors. 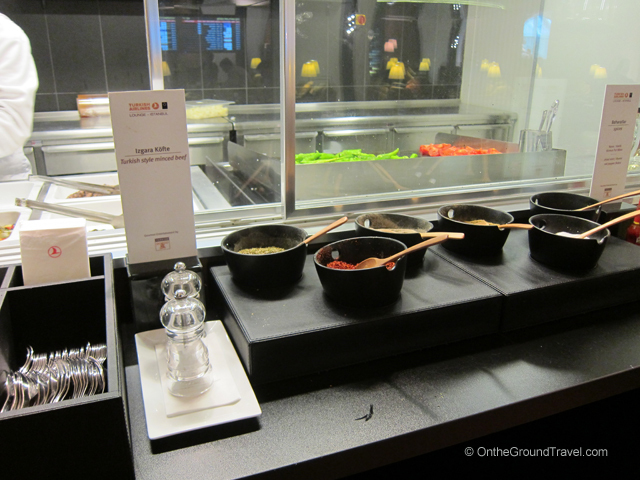 And best of all, everything was complimentary! What more can we say? If you don’t believe us, check out the pictures below. Washing your own clothes? But of course, it is the most economical. However, it takes time to wash clothes. Then you have to worry about how will you dry them? If you’re in a cool and damp climate clothes will take more than a day to air dry. Buying new clothes is the fastest way to clean clothes. This can work well if you know where to buy cheap clothing. This normally works best for undergarments and t-shirts. If you have built up a pile of dirty clothes, you’re probably better off dropping the clothes off somewhere for washing. Now if your hostel doesn’t do laundry or your hotel charges per piece, you will have to find and take the load of laundry somewhere to be washed, this might be easier said than done. 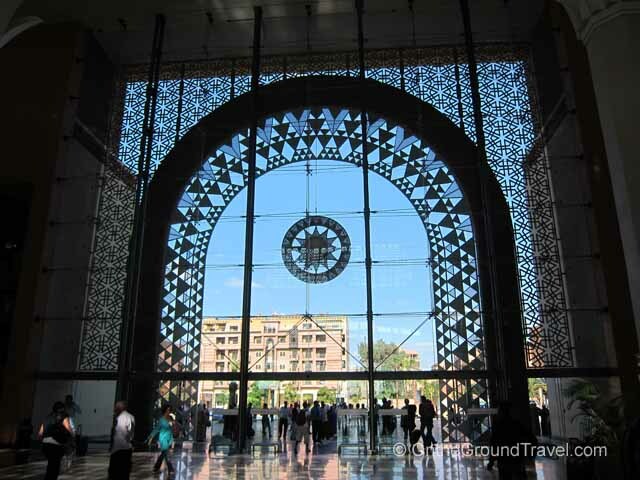 In Marrakech we located ONE place that will allow you to drop off your laundry and pick up your clothes that evening or later. 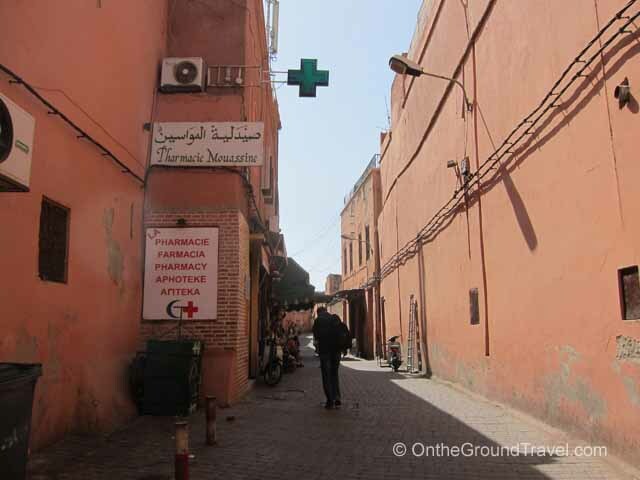 It’s called Lost in Marrakech and as we discovered, trying to find it for the first time will undoubtedly cause you to get lost in Marrakech so the name is quite fitting. 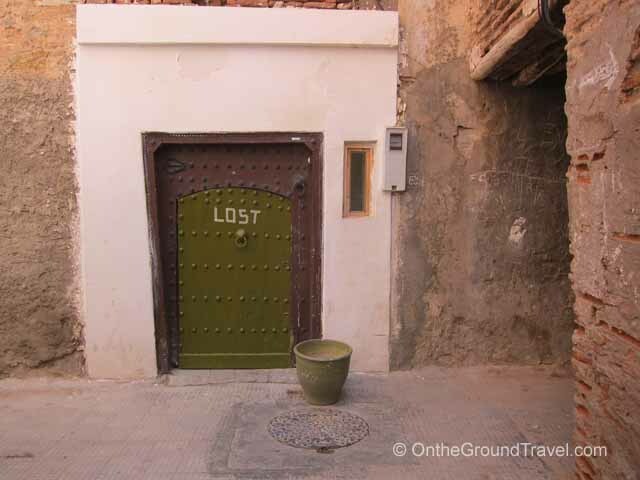 We’ll cover Lost in Marrakech in another article but if you are in Marrakech and you need laundry done quick, follow the map below to find this hidden clothes washing location. Knock at the door and ring the doorbell. Hours are 9am to 4pm daily. Start at Djemaa el Fnaa square. If you’re a speed walker you can do the walk in 5 min. If you take a leisurely stroll it may take you up to 15 or 20 min to walk. 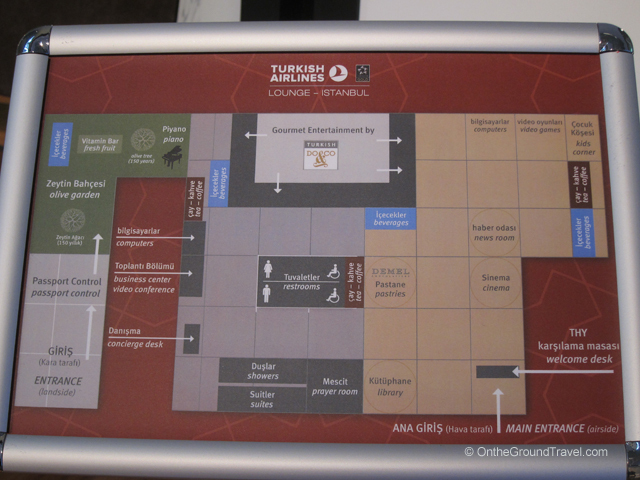 See gallery images for hints of what the area looks like at each of the marked locations.